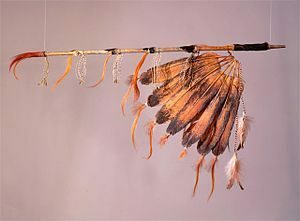 Those who desire to benefit their spiritual path by learning Native American knowledge and wisdom, some of which will come through the ceremonies, are recommended to get a peace pipe. The peace pipe is not restricted to only Indians. It has been jealously guarded by Native Americans, however, because many are fearful that the pipe may be used disrespectfully by non-Indian people. Many believe that a powerful good for all things can emanate from the respectful and proper use of the pipe, but it must be regarded as a spiritual instrument by the pipe holder, whatever their lineage or color happens to be. The pipe can become a strong catalyst to import a powerful feeling for our Mother Earth and all living things. Black Elk predicted that we would go forth in numbers as flames to bring forth beneficial change to this generation. The pipe, and the respectful pipe holder, will be a needed force to disseminate a spiritual basis for the goal being sought throughout this nation. There are far too few Native American pipe holders to accomplish all of this alone. Even some Native Americans must be reminded of our four cardinal principles: respect for Wakan Tanka, respect for Mother Earth, respect for our fellow man and woman, and respect for individual freedom. There are many good and understanding non-Indian brothers and sisters who deeply respect the knowledge and wisdom that emanates from the Indian Way. In the past, we suffered greatly from those that came upon the red path only to convert, destroy and replace it. Those of this new era seek to help, not to destroy. They are open-minded, not narrow minded. Indian people should allow these people insight; together we will all join forces to make a better and a more peaceful world. The ceremonial use of the peace pipe is a simple ritual. The peace pipe serves as a portable altar. It is loaded with tobacco, and only tobacco, or a tobacco variation called kinnic kinnick , which is the bark of the red willow and non-hallucinatory. The bark of the red willow has a pleasant aroma, and served in the old days as a substitute, when tobacco was scarce on the great plains. No form of mind-altering substance is condoned by Native American religion traditionalists. Unfortunately, peyote, a mind altering cactus bud , is wrongfully associated with traditional Native American religion and ceremony. The True Native American Way finds the Great Spirit through “our own juices” (fasting, knowledge and observances of God’s creation and the Sun Dance, Vision Quest, and Sweat Lodge ceremonies). We do not need or use hallucinating substances. The pipe ceremony begins with loading tobacco, a natural substance, into a pipe and then acknowledging the four directions, Mother Earth, and Father Sky; it culminates with the final offering to the Great Spirit. The pipe is held firmly by the bowl in the palm of the hand with the stem pointed outward. The last step of the pipe offering is the holding up of the pipe with its stem pointed straight upward, out into the center of the universe. Although the Indian admits that God is everywhere, in ceremony, Wakan Tanka is regarded as above. A Sioux pipe holder might begin with the east direction for the first acknowledgement, but there is no such requirement. I prefer the east because the sun rises in the east, and it is the beginning of a new day for each of us, so the following description begins with an east-facing celebrant. This is an example of an Indian prayer beginning with the east. Onlooking participants will also face east while the pipe is loaded in such a manner. The pipe holder turns to the south and points the pipe stem in that direction. A new pinch of tobacco is held slightly above eye level in a southerly direction. Onlooking participants face south. After such acknowledgement, the pinch of tobacco is put into the pipe bowl. The pipe holder then faces west. The pipe holder sprinkles some tobacco upon Mother Earth and puts some tobacco into the pipe bowl.
. The last of the four directions is the north. A note regarding prayer or acknowledgement; Indian people memorize few prayers or acknowledgements. R ote prayers are not recommended. The Our Father, common to Christians, would be considered too lengthy a recital to be memorized by traditional laypeople. Sioux holy men, holy women, and medicine people do chant lengthy songs and prayers in a prescribed manner for certain ceremonies. But, by and large, Indian prayers flow from the heart. A prescribed symbology is followed, especially in regard to the four directions. Knowledge in relationship to the east, growth from the south, and so forth are included, but rote prayers are not generally followed. A note on the colors of the four directions: the red, yellow, black, and white, beginning with red for the east and following clockwise to the south, is in accordance with Black Elk. Some medicine people interpret the four directions as depicted. Many Sioux people, especially those who have not read Black Elk Speaks, however, use other color arrangements; blue is often substituted for black. Traditional Indians do not squabble over the colors. Rarely, if ever, do arguments spawn over such trivialities. Indian people consider it disrespectful to argue over the Great Mystery’s mystery. Acknowledge, respect, and do not harm one another or interfere with another’s spiritual visions are cardinal traditional Indian principles. Tobacco is sprinkled upon Mother Earth and the pipe is loaded. The pipe is then pointed at an angle to the sky. We usually point our pipe towards the sun; if it is evening, we point it towards the moon, to acknowledge Father Sky. The pipe tobacco in the bowl is then capped, or temporarily covered, with a piece of sage (flat leaves of cedar or other natural material may be used in place of sage for capping the pipe), which will be removed when the pipe is ready to be smoked. After the sage is inserted, the pipe is placed on a pipe rack to await the completion of the ceremony that will follow. (Many pipe bowls, especially on ceremonial pipes, have a pointed tip. The pointed end is inserted into the ground with the stem usually pointed towards the sun or moon. In the Sun Dance Ceremony and during an evening Sweat Lodge, pipe stems generally face the west.) If a pipe is to be smoked immediately after loading, it need not be capped. In a Sweat Lodge Ceremony, the pipe is smoked following the ceremony, after the participants emerge from the lodge. The ceremony ends in the smoking of the peace pipe. Usually the participants will change into dry clothing, before they gather in a circle to smoke the peace pipe. After this last ritual, the participants can then partake of a meal, which is a general custom following an evening sweat that is not a preparatory ceremony for a Vision Quest or the Sun Dance. The smoke from the pipe represents the participants’ visible breath and stands for truth: truthful words, truthful actions, and a truthful spirit. In regard to the actual smoking, most participants do not inhale the tobacco. Nonsmokers simply hold the pipe for a moment and then pass it on to the next person. 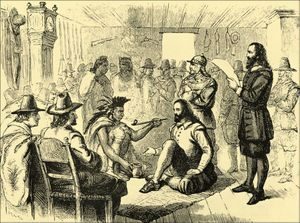 If there is still some unburned tobacco remaining within the bowl after the pipe has made its journey around the circle, one who smokes will general be asked to smoke out all the tobacco loaded in the pipe; the ashes will be cleaned from the pipe and sprinkled upon Mother Earth. The pipe ceremony is then finished. The pipe is then disassembled. It’s bowl, generally, resides within a red cloth sack within a pipe carrier’s buckskin or animal hide pipe bag. A cloth pipe bag may be used in place of a hide. When a peace pipe is loaded indoors, a woman will usually serve as acceptor for the tobacco that is normally sprinkled unto Mother Earth. The woman represents the White Buffalo Calf Woman and will take the accumulation of tobacco offered to the four directions, Mother Earth, Father Sky, and the Great Spirit outside at some later time and sprinkle the tobacco upon the earth.